Most of us hear about the fabulous Hollywood and A-list weddings that take place from the photos cropping up in a glossy magazine (or online) a few days or weeks later. But there are some stylish weddings you may miss if you're not quick enough, thanks to the fact that before they even make it into a magazine, they're now plastered all over Instagram. Case in point is actress Dianna Agron's recent marriage to Winston Marshall, the banjoist for Mumford & Sons. This year, the pair wed in Morocco surrounded by some very stylish-looking guests who snapped some incredible pics of the pair, including shots of Agron's two gorgeous wedding dresses. But this isn't the only couple to have wed in 2016. Over the past year, we've kept an eye out to spot some of the most fashion-forward nuptials that have taken place. Whether that's because the bride had three designer wedding dresses or that the guests are some of the most stylish we've ever seen, take a look at our visual guide to the most fashionable weddings to take place this year so far. Click through our gallery for the best and most stylish weddings of 2016. You won't be disappointed. 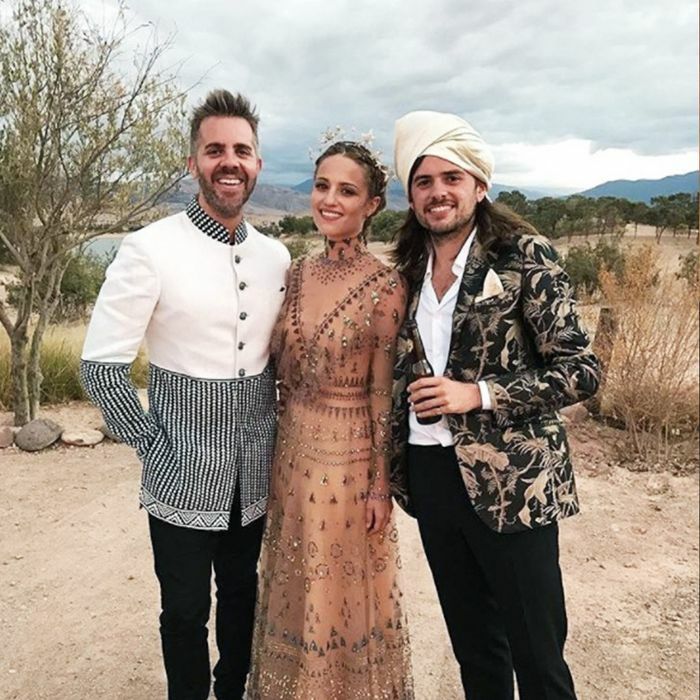 Dianna Agron married Winston Marshall (right) in Morocco, and instead of a traditional white gown, she opted for a gorgeous dusky pink Valentino dress. But the Valentino wasn't the only frock Agron wore for her nuptials. Here, she wears a Gucci gown. Another snap of that Gucci look. Contender for coolest bridal look of the year? Model Agyness Deyn got married to hedge fund manager Joel McAndrew in a gorgeous gown by Molly Goddard. The subtly pink dress had sheer sleeves with a tulle skirt—a signature style of the designer's. Another sweet snap of the happy couple. A closer look at the model's gown revealed the sheer sleeves and the fitted bodice, which were complemented by the simple makeup and unfussy hairstyle. Best pal designer Henry Holland made the trip to NYC, where the model had her nuptials. Singer Ciara and her now husband, football player Russell Wilson, got married in Peckforton Castle in Cheshire in July of this year. Peter Dundas for Roberto Cavalli designed the dress that included multiple layers and numerous fittings around the world (two in New York, one in Milan and one in the UK, if you're wondering). Fun fact: Peter Dundas also initialled this mega veil for Ciara. Brazilian model Ana Beatriz Barros got married to Egyptian-Greek businessman Karim El Chiaty on Mykonos this summer and wore Valentino. Did you ever see such a beautiful bridal party? The model also wore a different gown for the day before. This one was created by Alessandra Rich. Sometimes, a wedding (and the dress, of course) comes along that's so cool it hurts. Here, food writer Anna Barnett, who used to work for Henry Holland, wore a yellow Roksanda dress for her Hackey-based nuptials. PS. You can still buy it for £717 in the sale. As with most stylish weddings, one ceremony simply won't do. Anna Barnett, having married in London, then had a gorgeous do in Italy's Lake Garda, with a guest list that included designer Henry Holland and radio presenter Nick Grimshaw. The fashion blogger wore an incredible gown by Elie Saab. She married Paolo Soffiatti at a ceremony in Ville Ponti located on the outskirts of Milan. Creative agency owner Anthony Kendal married his partner in an incredible wedding this summer at Lismore Castle in Ireland. Attending the stylish nuptials were the likes of fashion editor and street style favourite Veronika Heilbrunner and model Daisy Lowe. Laura Brown, Harper's Bazaar's executive editor, was also in attendance. Style blogger Helena Bordon married financier Humberto Meirelles across an epic three ceremonies this year. This was the first at the registry office ceremony in São Paulo. Next up was a lavish ceremony in São Paulo at the St. Joseph Church in Jardim Europa. For this ceremony, she wore her mother's Valentino gown. Just check out that train! This is quite possibly one of the most beautiful wedding dresses we've ever seen. Such an elegant back, with a combination of lace and tulle. If you think Xenia Deli looks familiar, then it's probably because she played Justin Bieber's love interest in his "What Do You Mean?" video. The Victoria's Secret model married Ossama Fathi Rabah Al-Sharif this summer and wore a Zuhair Murad gown. The gown consisted of ruffles and lace at the back. Stunning. Perhaps one of the most lavish weddings this summer has been that of fashion editor Giovanna Battaglia. Battaglia married Swedish property developer Oscar Engelbert on the island of Capri, and their wedding had the highest number of wedding dresses and fabulous fashion guests we've ever seen. The bride wore numerous dresses—from this Alexander McQueen invention to a short minidress by Giambattista Valli. Another shot of that glorious Alexander McQueen frock. In an Alaïa raffia couture white dress. In that Alaïa dress kissing her new husband. In Giambattista Valli with the designer. The Hills' star married BMX rider Corey Bohan in a ceremony in Hawaii on November 5th this year. Model and heiress Lydia Hearst is engaged to comedian Chris Hardwick and has already given us a sneak peek of her incredible gown. Heart's dress has been created by designer Christian Siriano—a princess dress indeed. Sunday Times Style fashion editor Pandora Sykes married her now husband, Ollie Tritton, in a custom-made Temperley gown. The dress was created so that it had a fitted bodice but with a high lace neck, blousy sleeves and a panelled skirt. Oh, and it also transformed into a minidress for the evening. Phew. Want to shop incredible bridal frocks on a budget? There some amazing high street wedding dresses around right now.